One of the best models being made today. Robust, versatile, and just short of perfect. Recommended for: Anyone who can afford it. Easy enough for newbies to master, yet allows the kind of fine-grained control that purists will adore. Are you in the market for a super-automatic that does it all? 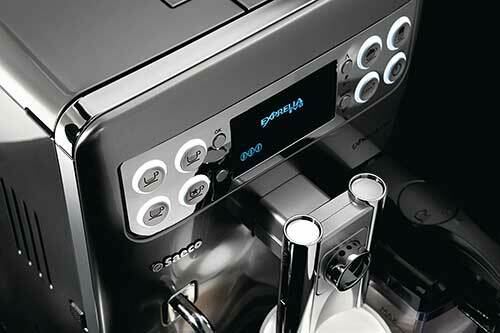 A machine that offers a variety of customization options, exquisite levels of control over the drink-making process, and one-touch convenience while still being incredibly easy to use? 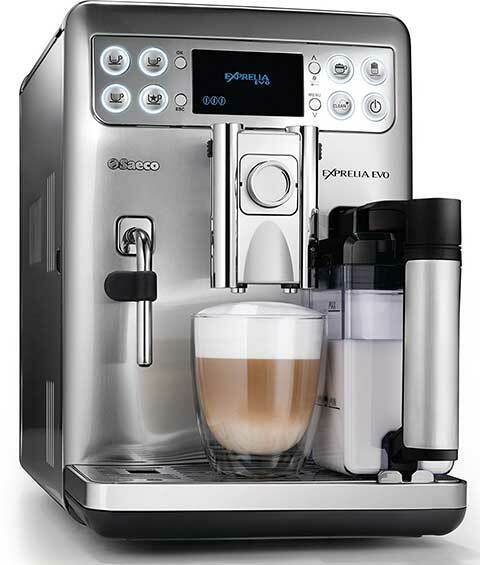 If you answered yes to that question, and have the money to spend, then you’re going to love our detailed review of the Saeco Exprelia EVO automatic espresso machine. While not quite a perfect machine, it has scored higher than any model we’ve rated to date, and in our view, is the standard by which all other machines should be measured. It is just magnificent, and even if you opt to purchase some other model, we think you’ll agree. By any measure, this model is exceptional and stands out, even in a crowded market. We’l​l cover every aspect of the design in the sections that follow, and include notes on its very few shortcomings, so you’ll have all the information you need to decide if this is the right machine for you. The first thing you’ll notice when you look at this machine is that it’s built to last. 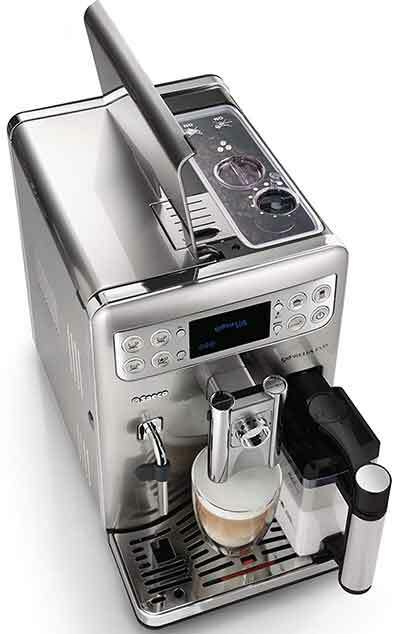 Dressed all in silver, owing to its stainless-steel construction, with proper care, this will be the last super-automatic espresso machine you’ll ever need. It’s obvious that the designers were more concerned with function over form, which is not to say that it’s an unattractive device, but its vaguely industrial look and feel may not fit in well with every home décor scheme. It’s also a sizeable unit, measuring 13” x 20” x 19.8” and weighing in at 35 pounds. As such, you may struggle to find a permanent home for it if you have a small kitchen, limited counter space, or low clearance between your countertops and cabinetry. The first question we want an answer to anytime we review a new machine is “how big is the water tank?” That’s because we’re power coffee drinkers and tend to be biased in favor of models that offer a high capacity here. 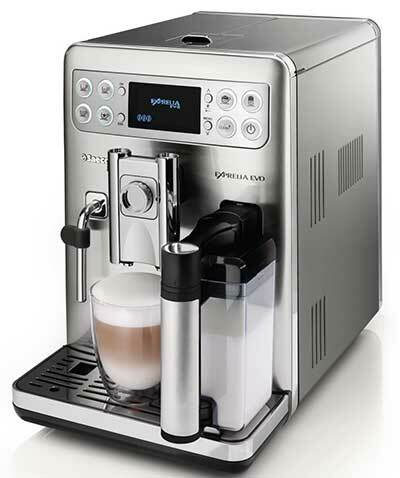 In this case, we were a little underwhelmed by what the Saeco Exprelia EVO automatic coffee machine offers. 54 ounces isn’t bad, but we would have expected slightly more in a machine of this size and price, sixty ounces at a minimum. The Evo also comes with a water filter for its tank, although its use is entirely optional. Opinions are divided on this front. The main advantage that the filter offers is that it virtually eliminates the need for descaling, which cuts down on the amount of periodic maintenance you have to do. The tradeoff though is the fact that replacement filters are expensive, and you’ll have to buy replacements at regular intervals. Over time, that’s going to dramatically increase your total cost of ownership on what is already an expensive machine. Also, there are other ways to minimize the need for descaling. You can simply use distilled water when you fill your tank, or, if you’ve got a water filter attached to the tap at your sink, then the tank filter is unnecessary. In any case, there’s no right answer to the filter/no filter question. It comes down to what works best for you. Note: The water tank is top-loading, which could be a further complication for people with limited clearance between their countertop and cabinets. While we were a bit underwhelmed by the size of the Exprelia EVO automatic espresso machine’s water tank, we fell in love with the grinder. It’s an all ceramic conical burr design with eight different grind settings. There are two things to like about this configuration. First, ceramic burrs are superior to stainless-steel, because metal heats when grinding beans. That can burn your grounds, which in turn, can completely ruin the flavor of whatever drink you’re making. 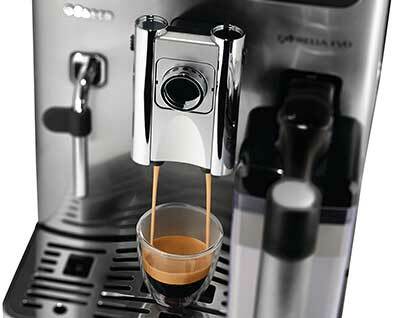 Second, the current industry standard is six grind settings, so the Evo gives you more options. That’s key because the way you grind your coffee will dramatically impact its flavor. The more settings you have to choose from, the more you can dial into your particular flavor preferences. Of course, there are some machines that offer even more, and we’d love to see even more in this model, but eight is a good number and does allow for a fair bit of flavor fine-tuning. Another, less important thing we like about this model’s grinder implementation is the fact that you don’t need a special tool (grinding wrench) to change your setting. It’s as simple as turning the dial located next to the top-loading bean hopper. Having to use a particular tool is inconvenient for a couple of reasons. First, if you have multiple coffee drinkers in your house, then the wrench is likely to be used a lot, which means that sooner or later, it’s liable to be misplaced. If that happens, you’re stuck with whatever setting the last person used. The second thing is that even if you’re the only coffee drinker in the house if you like to experiment with different drinks and flavors, having to reach for the wrench every time you want to make a change is annoying. Thankfully, with the Evo, you avoid both of those issues! Pro Tip: This is not something that’s unique to the Philips Saeco Exprelia EVO HD8857, but holds true for super-automatics in general. They don’t like oily beans. If you use oily beans, then over time, you’ll suffer more grinder clogs and run the risk of burning up the motor. Find a nice medium roast you like and stick with it for best results! Now let’s talk about the bean hopper itself. As we mentioned earlier, it’s top-loading and has a 10-ounce capacity. That’s impressive, and we like it very much. If we have one quibble though, it is the fact that it’s probably slightly too large, given the capacity of the reservoir. One thing we’ve noticed about some models is that when there’s a size mismatch between the water tank and the bean hopper capacity, it can leave you in the mode of constantly having to refill one or the other, or both. This is another reason we’d love to see the Evo’s reservoir expanded to sixty ounces or so. Another thing you’ll like about the hopper is that it has a rubber-lined lid, underneath the access panel, which helps to preserve the freshness of the beans in the hopper. A nice touch that adds polish to the design. On top of that, the Saeco Exprelia EVO superautomatic espresso machine has a 1-scoop bypass doser for those times when you don’t want the whole “beans to brew” experience. Another nice touch that further strengthens the design. The Saeco Exprelia EVO HD8857/47 has a double boiler system. 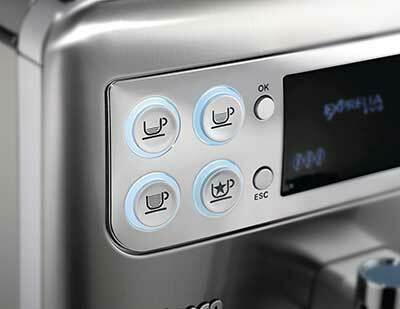 You pay more for these, but we prefer them because they allow you to brew coffee and steam milk at the same time. When you have a machine that only uses a single boiler for both functions, you’re left having to wait for the machine to shift gears and adjust temperature between one task and the other. Granted, the delay is usually measured in seconds, rather than minutes, but if you drink a lot of coffee, that can add up over time. Both of the Evo’s boilers are aluminum, lined with stainless steel, and both feature Thermoblock technology, which allows for rapid heating, thus decreasing your wait time even further. This is a solid win all around, and an excellent implementation by Saeco. The Philips Saeco Exprelia EVO HD8855 scores another big win on this front. It’s coffee spigots move up and down to accommodate cups ranging in size from 2” to 6.” It gets even better though because you can also take the spigots off entirely and use the extra room that creates to dispense straight into a jumbo-sized mug. As power coffee drinkers, we tend to use industrial-sized mugs like these, and it’s one of the only models we’ve ever found that accommodate our cups. Three cheers for Saeco for a superb feature implementation here! 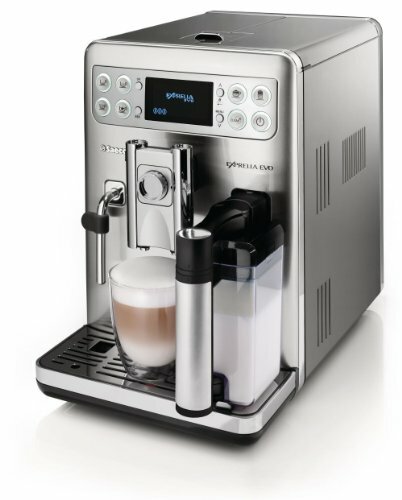 In our view, this is one of the best features of the Philips Saeco Exprelia EVO fully automatic espresso machine, but with so many outstanding features, it’s hard to pick just one! It goes without saying that as you add more capabilities to a machine, it’s going to get more complex, by definition, but the Evo keeps things delightfully simple, making excellent use of an LCD screen and a well-designed menu navigation system. While it would be overstating the case to say that there was no learning curve at all, it’s fair to say that given the excellence of the design, the Evo has an incidental learning curve. In addition to these, using espresso as a base and given the presence of two different milk frothing options (which we’ll go into more detail about in just a bit), the sky’s the limit. 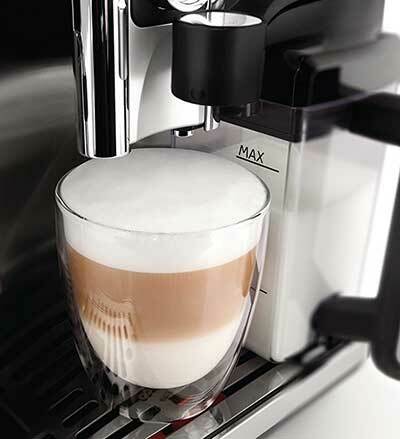 You can use this machine to create any specialty coffee drink you can find a recipe for. This last item is interesting and is controlled via the knob in the center of the front face of the machine, where all the rest are set from the menu on the LCD screen. By adjusting that central knob, you change the amount of pressure the machine uses to brew your drink, which changes the body and character of the coffee, as well as alters the nature and quality of the crema on top. You’ll want to experiment with this to further fine-tune the flavor of your drink until it’s exactly the way you want it. While we’re on the topic of changing the brew pressure, this is a very good time to talk about the difference between the way espresso is made vs. the way drip-brew coffee is made. If you’re new to the world of specialty coffee drinks, this is a detail you need to understand. If you’re an old hand, just skip this section. Drip-brew coffee makers work by flooding the grounds chamber with water, then relying on simple gravity to convey the coffee from there to your cup or pot. Super-automatics like the Saeco HD8857/47 Philips Exprellia EVO rely on pressure, rather than gravity, and pressure is measured in bars, with one bar being equal to atmospheric pressure at sea level. The Evo’s pump is rated at 15 bars, which means you’ve got plenty of pressure to make world-class espresso, every time you use the machine. So, back to the control system, in addition to adjusting all of the aforementioned drink settings, you can adjust the auto-shutoff time and activate the automated portions of the system maintenance routines. First, you cannot set an auto-start time. This is something that many machines allow, but given the fact of the quick-heating boilers, its loss isn’t a deal breaker by any means. Second, you have to go into the system menu and tell the machine that you’re using a filter if you opt to use one. The machine does not have an auto-detect feature for a filter in the tank, and if you put one in, but don’t adjust the machine settings, it will still prompt you to descale. Knowing that in advance may save you a bit of head-scratching later on! Where the brew unit is concerned, the HD8857’s is removable, which makes it easier to clean than the norm. This is our absolute favorite aspect of the Evo because it’s’ one of only two models we’ve ever seen that give you the best of both worlds, featuring both an auto-frother and a steam wand. This is perfect, in our view. If you’re looking for maximum automation, then you’ll almost certainly gravitate toward the auto-frother, which features a sturdy plastic carafe for milk. Just plug this carafe into the designated slot on the machine, move the spout over your cup, select a milk-based drink, and stand back and watch the show. Literally, everything is done for you, but again, you can adjust the amount of milk and foam you get from the menu. On the other hand, if you prefer a more hands-on approach, you can make use of the steam wand (Which pulls double duty as a hot water spout for making tea and other hot drinks). This gives you the kind of fine-grained control that coffee purists crave, allowing you to get exactly the amount of foam you’re after, at precisely the temperature you want. The only downside to this approach is the fact that invariably, most people only use one or the other, which means you’re paying for a feature you don’t need, but that’s only an issue if you’re the only coffee drinker in your household. If not, then odds are good that someone will prefer using the other milk system. Either way, it’s something to add to the equation when making your final decision. Personally, we love the flexibility this approach offers. If we’re feeling artistic, we can use the wand, and if we’re in a rush, we can use the auto-frother. It’s fantastic. Pro Tip: One other thing to mention here is that if you’re new to the world of specialty coffee drinks, don’t be intimidated by the steam wand, especially if you’re looking for reasons to let your inner Barista out to play! ​Yes, it takes practice to learn to use it well, and your first three or four milk-based drinks might not turn out exactly as you’d hoped, but keep practicing! 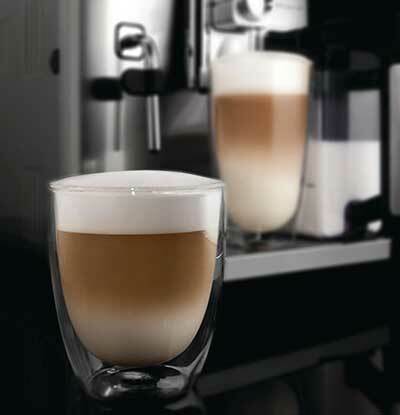 Once you master the steam wand, you can make coffee magic in almost any setting and dazzle your friends. Specialty coffee drinks were meant to be enjoyed at temperatures lower than most Americans like their coffee. This is especially true of milk-based drinks because milk must be steamed at temperatures lower than coffee is brewed, lest it ruin the flavor of the milk. When you add that to the coffee, you lose more heat. Then, if you dispense your drink into a cold cup, you lose even more. The result is an unsatisfying drink to most American palates. The cup warming tray solves a big part of this problem by virtually eliminating the heat lost by dispensing into a cold cup, and if you’re not satisfied with the heat of the milk, even on the highest temperature setting, then using the steaming wand will solve that problem too, because with the wand, you can make the milk as hot as you want it. If you have doubts about how big an impact the warming tray has on your final output, take advantage of the fact that the Evo offers one, and brew your favorite drink, dispensing it into a cold cup. Then brew a second into a pre-warmed cup. You’ll be astounded at the difference in temperature! 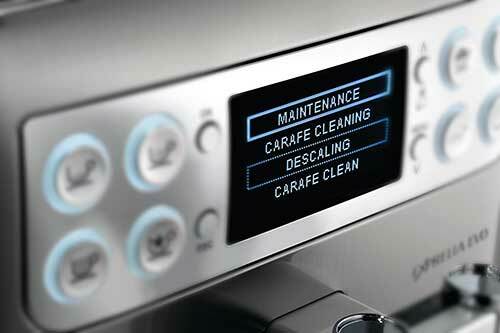 Not only is the menu system well-designed and the controls simple, but everything you need to clean manually is easy to access, which makes cleanup a snap. Yes, it does take some time to program your preferred settings into the drink buttons on the machine, but that’s a one-time operation, and the moment you have them the way you want them, from there on, you get to enjoy one-touch simplicity. We love the layout of both the machine and its control system and regard it as one of the numerous advantages the model offers over many of its competitors. More User Profiles – This would be huge. Right now, each of the one-touch buttons will hold one person’s customization options for that drink. If someone else comes along and saves their favorite settings, yours will be deleted. Having multiple user profiles would allow several people to each save their favorite drink settings. In a machine that can do it all, this just seems like the next logical step. Even more grind settings. We considered not even putting this here because the Evo already offers more settings than the industry standard, but more’s always better, so if they could bump it up to 12 or 18, we’d be even happier with the feature! There’s a lot to like about the Saeco Exprelia EVO automatic Espresso Machine, and only a very few things we could think of that would improve the model. It really is one of the best machines on the market today and will provide you with years of reliable service and give you unmatched flexibility when it comes to making your favorite specialty coffee drinks. Saeco Exprelia EVO User Manual. What Temperature Do Coffee Machines Brew Coffee At? Aquaspresso. What Is Specialty Coffee? SCA News. The Scope For Specialty Coffee. The Coffee Guide.